Depart from your hotel in Hanga Roa and relax on a scenic drive towards the Tahai ceremonial complex. Enjoy a short stroll to the entrance of the site then plunge into a comprehensive cultural tour of the enclave with your knowledgeable guide. Gain insight into the origins of the magnificent moai statues as you admire the colossal sculptures carved from hardened volcanic ash; learn about indigenous Rapa Nui tribes and how the figures represent the spirits of ancestors. Wander through the site independently during some relaxed free time, noting distinctive statues sporting prominent red ‘top knots’ and facial features decorated with glittering obsidian rock. Observe solitary moais and groups of sculptures varying in size and shape as you explore this area of great historical interest. Return to the minivan to begin the journey to Ana Kai Tangata, home to a captivating coastal cave. Allow your guide to direct your attention to vibrant red and white drawings of birds in flight and note the petroglyphs of manutaras, or birdmen, around the cave. Enter the subterranean depths of the cave to discover more fascinating murals as you listen to the waves crash against the cliffs, and hear captivating legends of the tribesmen who used to fling themselves from cliff tops in search of the first egg laid by a native bird. 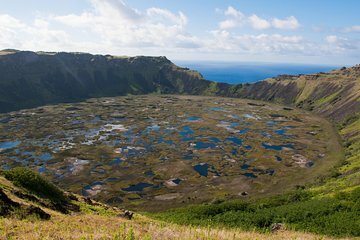 Leave the cave in favour of the colossal Rano Kau volcano and its glittering crater lake; capture this dramatic landscape from three different vantage points before venturing to the village of Orongo. Admire each of the 54 characteristic oval houses made from natural materials and enjoy panoramic ocean vistas; wander this unique settlement independently until its time to return to your hotel in the comfortable minivan. Great tour of Easter Island to be able to see and hear stories of some fascinating sites. Tour guide was excellent and offered the tour bilingually though less English as English-speakers were a small minority. The tour group size was a bit large, but for the price and the quality of the guides, I would definitely recommend this tour! I did the two half-day tours on different days, which was perfect.